The new BlackVue DR750S-2CH is the only dash cam on the market to offer built-in WiFi combined with GPS. 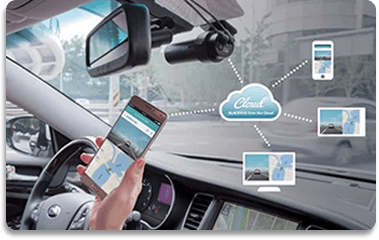 This is a world first in-car camera system for your car that incorporates easy wireless viewing, removing the need for an LCD screen. A high quality 2.4MP SONY EXMOR lens offers 1080P Full HD resolution at 60 frames per second providing smooth recording and license plate recognition. The user can also choose to increase the cameras bit rate up to 8mb/s (front) 3mb/s (rear) for improved video quality. An innovative cylindrical design enables the DR750S-2CH camera to be rotated 360′ degrees to ensure optimum viewing and customization of viewing angles. The cylinder shaped design means the unit will neatly and conveniently sit behind your rear vision mirror. The DR750S-2CH uses a security LED to notify that there is a security camera operating in the vehicle. This LED can also be disabled using the BlackVue software program or smartphone App. The BlackVue DR650S-2CH is the only dash camera on the market to have viewing software for MAC computers as well. Users can view, download footage and monitor their recorded footage on MAC computers. The new BlackVue DR650S series now comes in a discrete all black design, this is too hide the camera when installed in your vehicle from preying eyes. A big improvement compared to the previous DR550GW models. The DR650S-2CH comes with a compete kit including two cameras, mounting brackets, cigarette lighter plug for easy installation, manuals, cable clips and a coax cable to connect the front and rear camera. BlackVue systems have the ability to run in Parking Mode, monitoring your car when you’re not around. When wired in with the Power Magic Pro this mode will activate when the car is off.